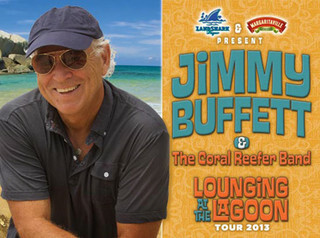 Dave and I went to a Jimmy Buffett concert last week! The Pensacola show was at the tail end of the Lounging at the Lagoon tour. Cross that one off our Florida bucket list! We honestly didn’t know what to expect. We read about folks tailgating hours before the concert, but since the concert was on a Tuesday, and we’d have to deal with babysitting on a school night, we elected to pack our camp stove and take some marinated chicken to grill. Dave and I also packed plenty to drink in our cooler: Margarita, whiskey sours and plenty of beer. 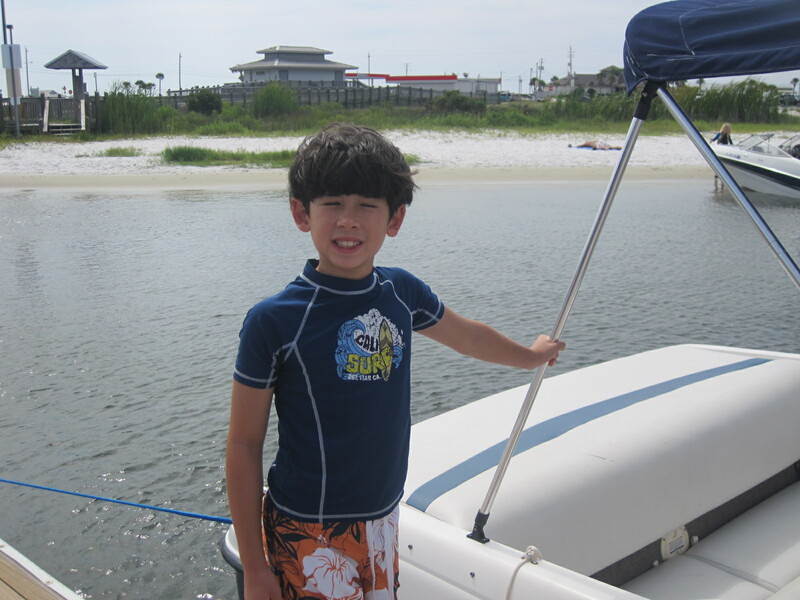 We left as soon as the boys came home from school, and arrived at the Pensacola Bay Center at 4pm. Four hours till showtime. We got pretty good parking, with the venue less than a 5 minute walk away. There were plenty of things to do, lots of people-watching! Everyone dresses in tropical apparel; Dave wore one of his numerous Hawaiian shirts with flip flops, and I wore a Hawaiian dress. I didn’t get good photos of the concert itself, but the Parrotheads of Pensacola did and put their album online here. 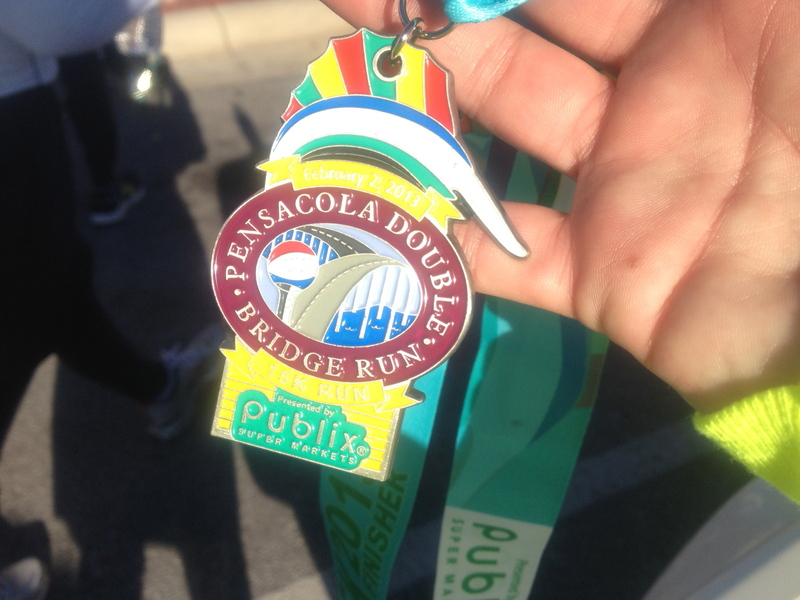 Pensacola Double Bridge Run, Take Three! Bright shirts, bright sky! 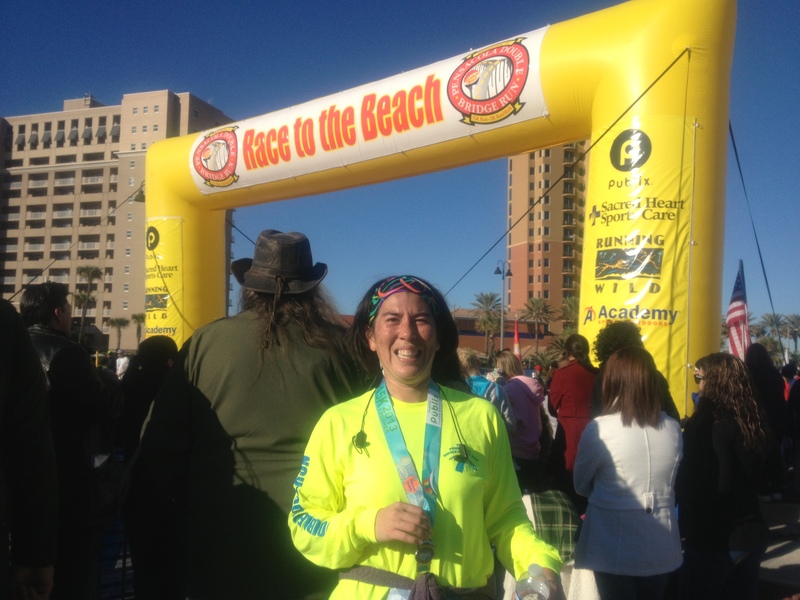 This year I ran the 15K in my fastest time! 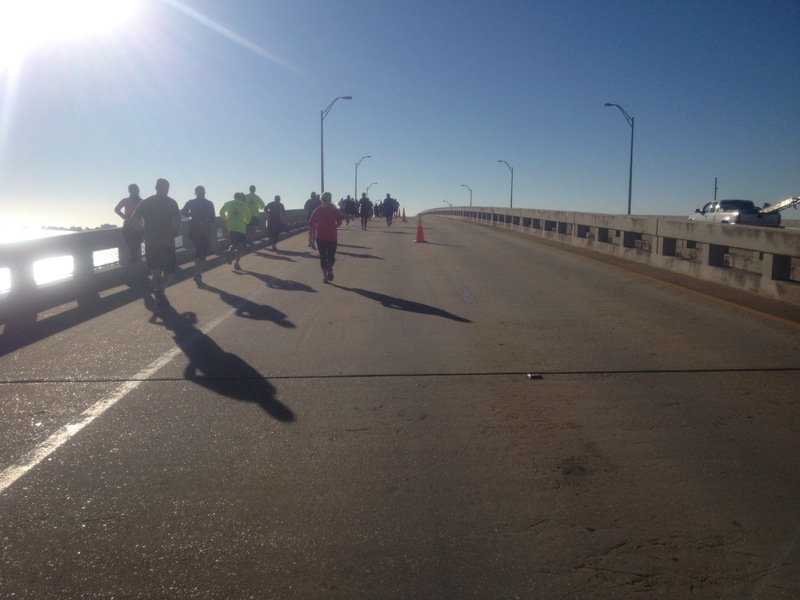 This past Saturday I ran my third and final Pensacola Double Bridge Run. This year the route was slightly different, and there were medals for the 15K finishers for the first time. This is also the first year the 15K race sold out (I believe they capped it at 2500 runners). As always, I have to be on the buses before 6am to be transported to the race start, which this year was at the new Pensacola Maritime Park (where the minor league baseball team plays). 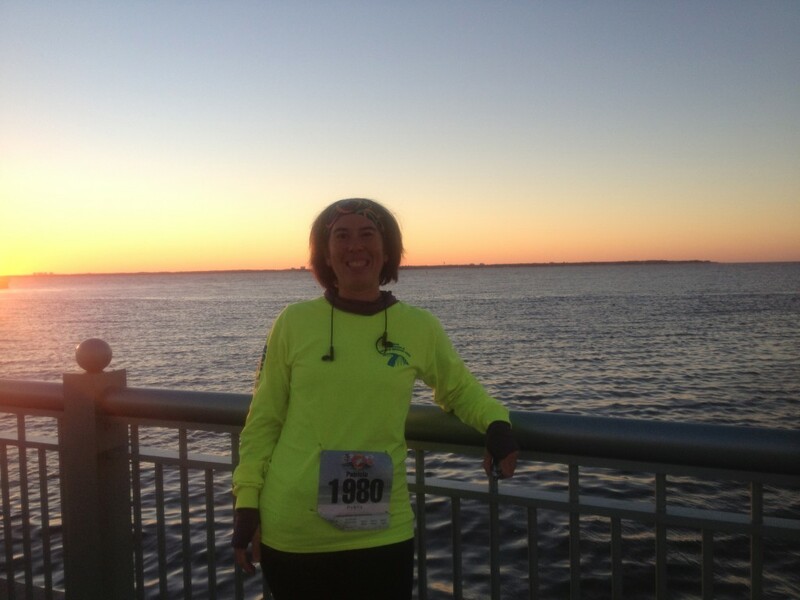 A lovely sunrise over my right shoulder (on the left in the picture) before the race started. The first year I ran this in 2011, the weather was chilly and it was overcast the entire time. There was a brisk north wind that seemingly propelled me across the two bridges. In 2012, the wind was from the south, still overcast, but about 30 degrees warmer. You could wring out my shirt after finishing that one. 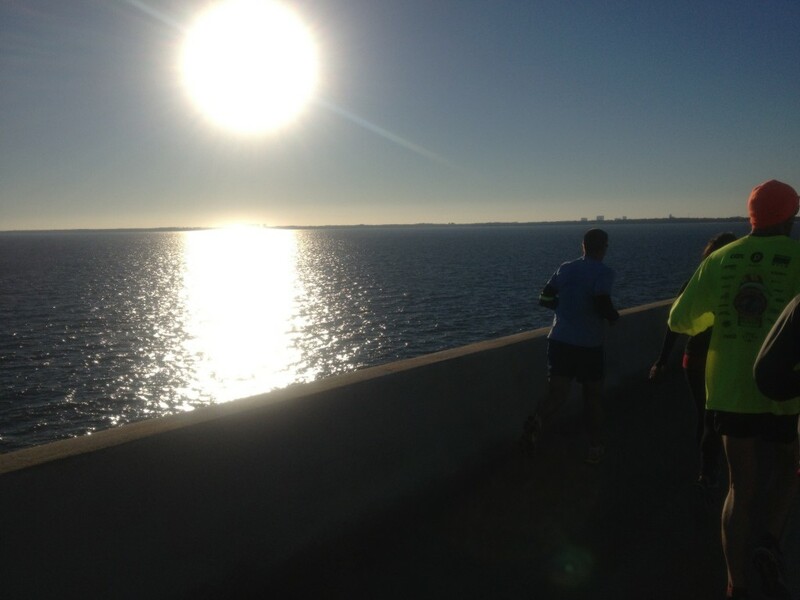 And a south wind means it felt like I was running in place when on the bridges. For 2013, there wasn’t a cloud in the sky and it was in the mid-30s at race start, and around 50 degrees by the time we finished. The sun was in our faces, and I even had a little bit of a sunburn! The sun was in my face during the entire race. With temperatures in the 30s and 40s, it was a welcome addition. I don’t like running with sunglasses, so I was essentially squinting the whole time. I am testing the MapMyFitness iPhone app for GeekMom; the app mapped my route well, but it seemed to pace me pretty fast: 1:28 hours for the 15K (a little more actually, which is something I’m working out with the company), which is much faster than I usually run. My official race time is around 1:30 hours, which is more realistic. I’ll say more about the app in my official review. I also took many pictures on the route, and the pictures geolocate along the route in the app, which is also pretty cool. One of the 22 pictures I took along the route. Most of them look like this, to be honest. In this case, I’m ascending the Pensacola Beach Bridge (the 2nd bridge of the two). On the entire route, the outermost of the northbound lanes were blocked off for us. The finish is very inspiring, and the after party is a lot of fun. We finish the race near the Boardwalk section of Pensacola Beach, and the numerous businesses there work together to provide free food and beer to the finishers. I love my medal! It’s designed in the spirit of my favorite gaudy sign (linked photo courtesy of Fotomom)! 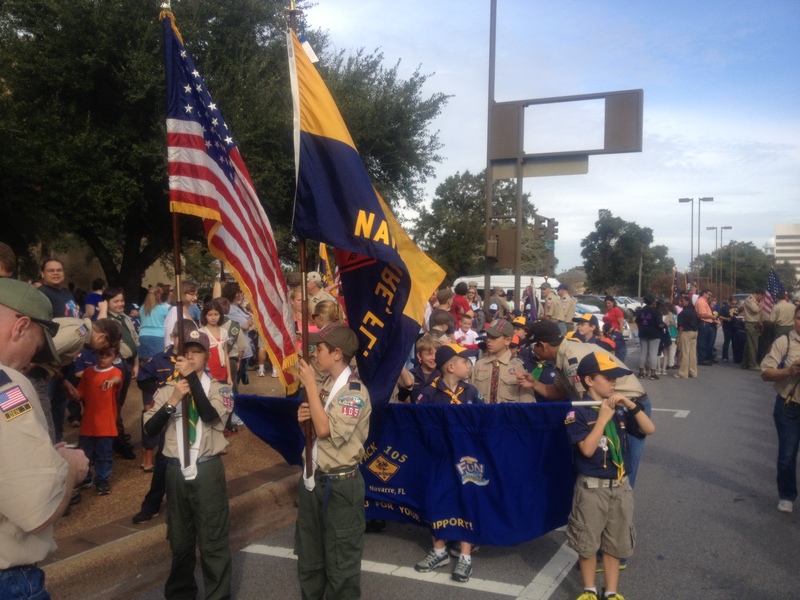 Like a heel, I forgot to bring our good camera, but I was able to get a bunch of nice iPhone pictures of Pack 105’s participation in the Pensacola Veteran’s Day Parade. First I have to show off these two pictures because they melted my heart! 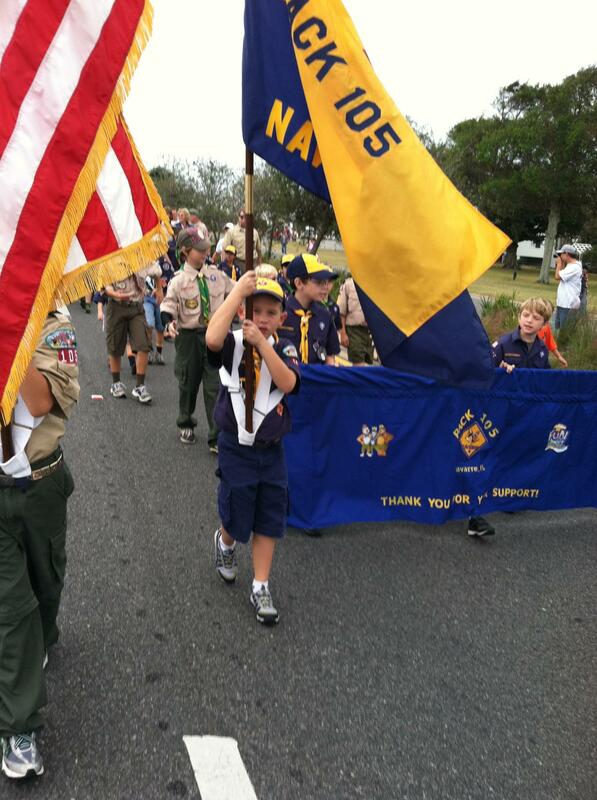 The Scouts took turns carrying the flags…Timmy briefly carried the Pack 105 flag during the parade. The flags are very top heavy, so mainly older Scouts did this task, Timmy didn’t last very long at all. 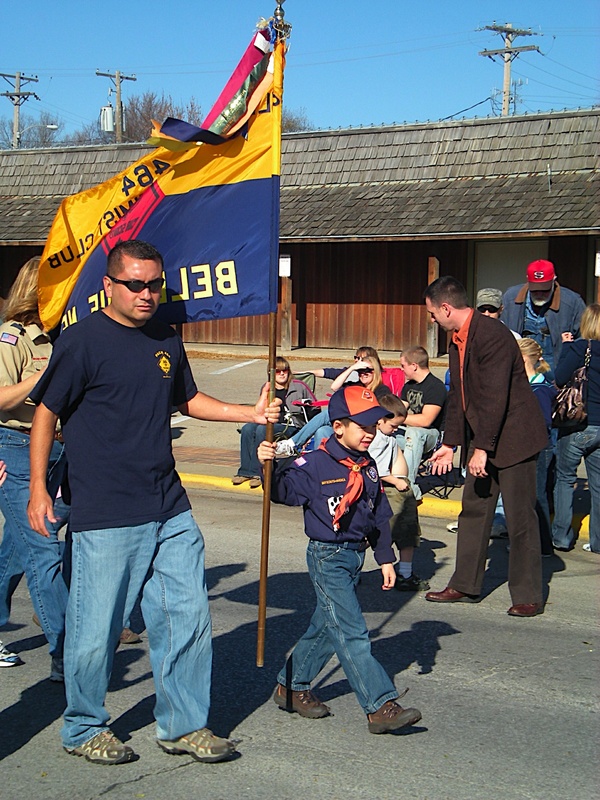 This reminded me of the time Jacob carried the Pack 464 flag when we were in Bellevue, NE. He was a cute little Tiger scout at the time. Now for this year’s event. 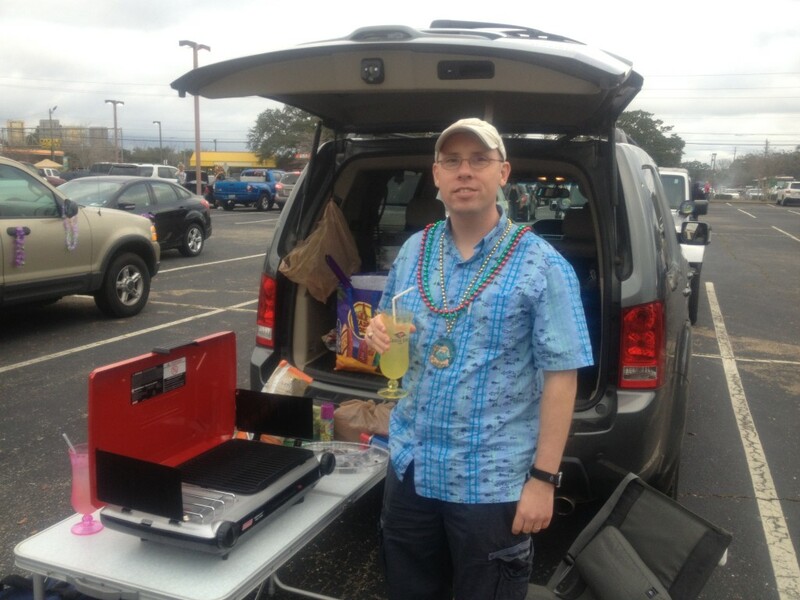 I was the coordinator for our Pack this year, taking care of registering the Pack with the Gulf Coast Veteran’s Advocacy Council, and then setting up a meeting space for the Scouts and their families. 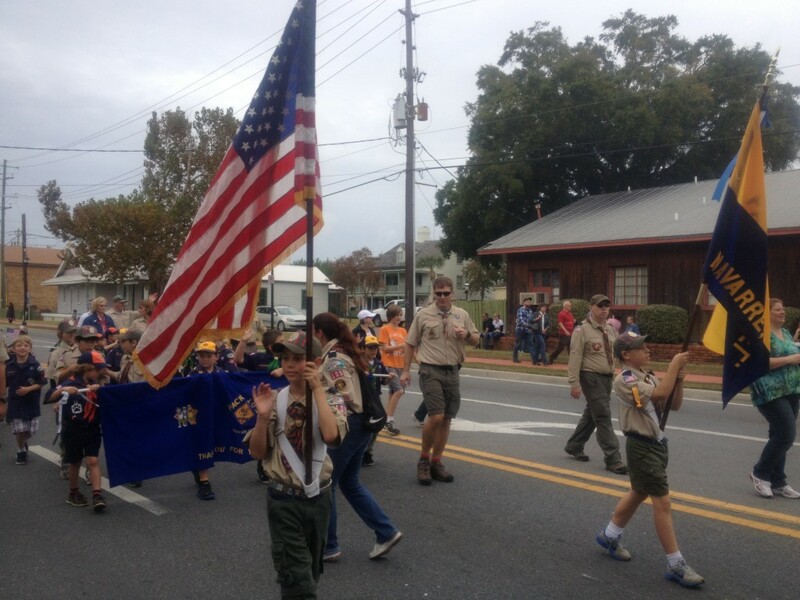 We don’t live super-close to Pensacola, so we only have a smaller group take part, but it’s so rewarding seeing the Scouts waving at the spectators. 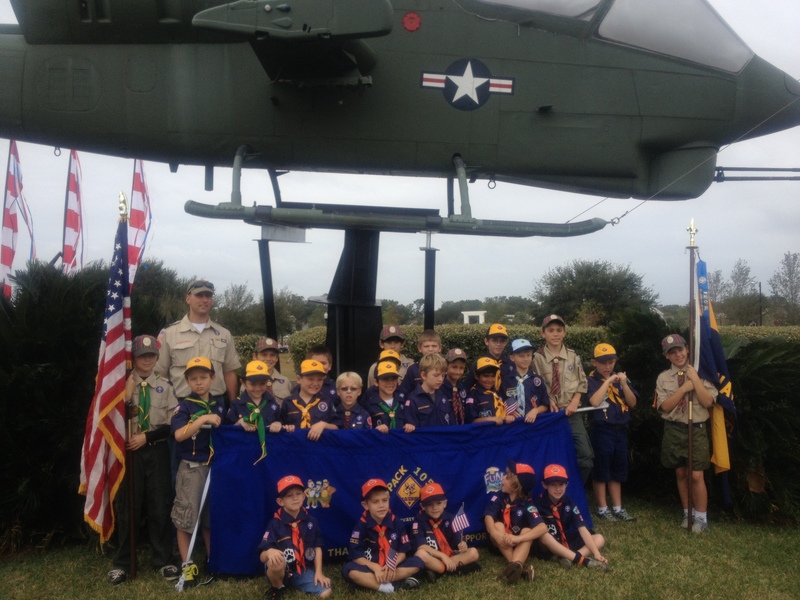 The older Scouts were noticing all the Veterans who were standing at attention saluting our group’s American flag. 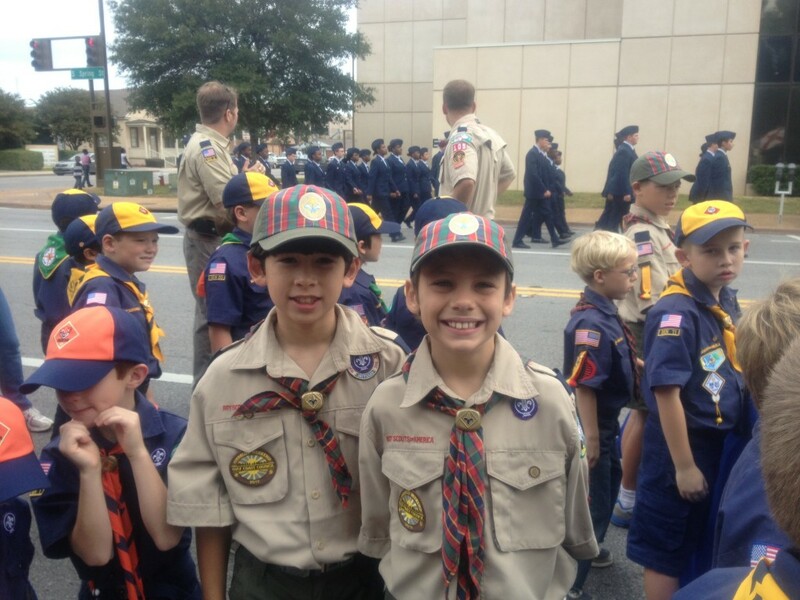 These poor Scouts had to wait…and wait…and wait…for our position in the parade to start walking. There were over 100 entries and we were #83, phew! Jacob and his friend Seth. When we finally started marching, the kids were definitely ready to go! They were so busy looking at the spectators, we had a couple of crashes when the group in front of us stopped and we were completely paying attention. 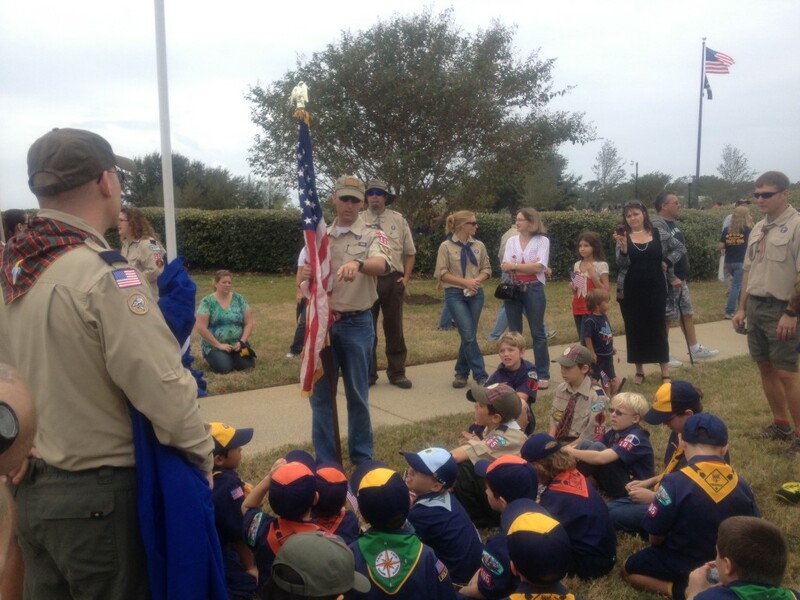 After the parade, one of the den leaders held a class on proper use and display of the U.S. flag. An awesome picture of the boys who stuck around for the flag class. 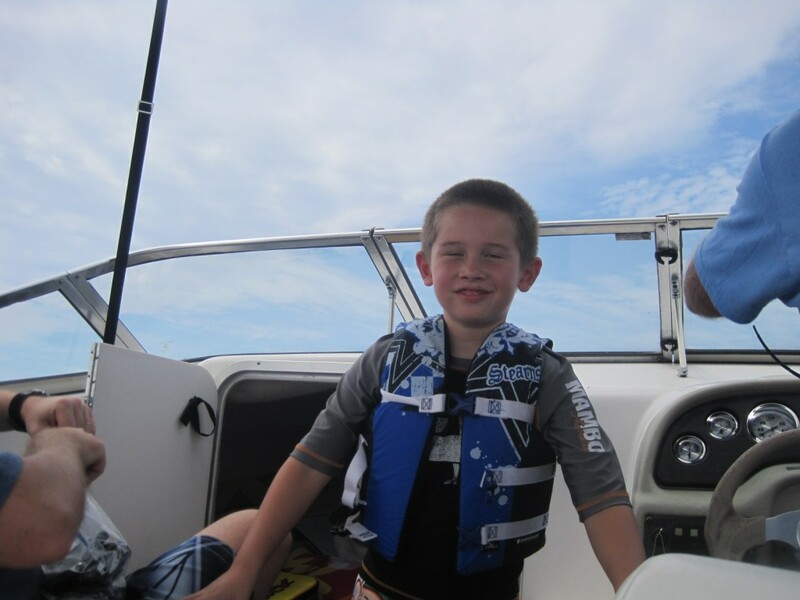 Our friends and neighbors, the Scotts, took our family out on their boat last weekend. It was so kind of them to offer; their boat seats 4 adults and 2 kids pretty well, but no more passengers than that can fit, so we had to find a weekend that didn’t involve other visitors. We here thought we were going to have a visitor this weekend, my girlfriend Susan from Virginia, so we had said “No, thank you.” to the invitation at first. Susan canceled at the last minute because of Issac impacting her return trip. 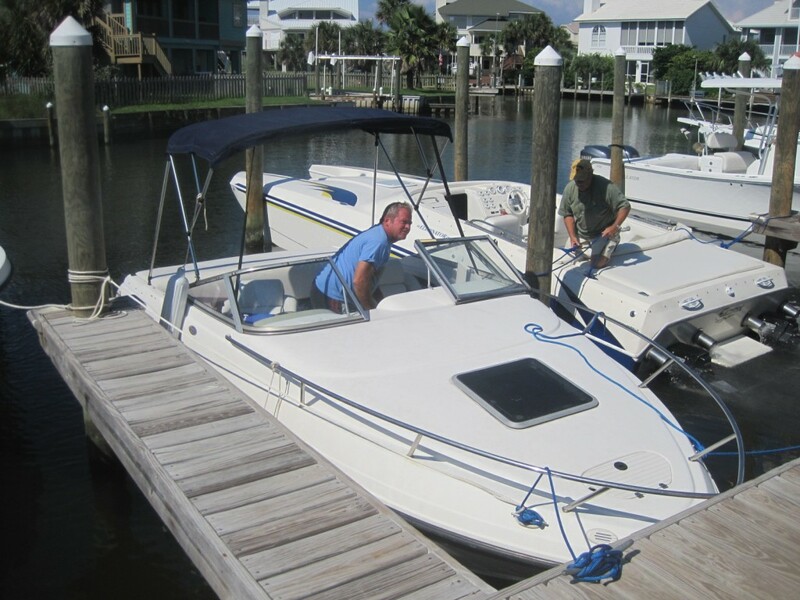 So then we were able to fit in a trip just before hunkering down and preparing for Issac. 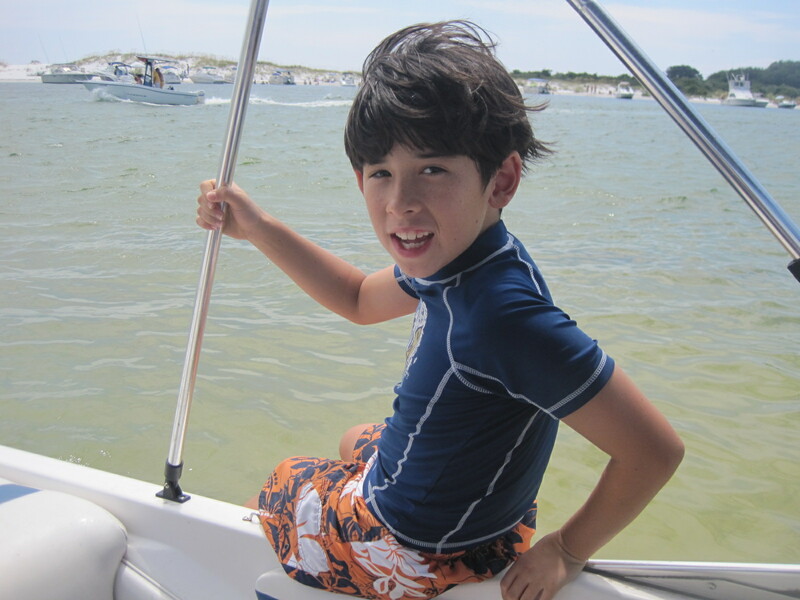 Michael and Cathy gave us a choice: would we like to go east to Crab Island or west towards Pensacola Pass. 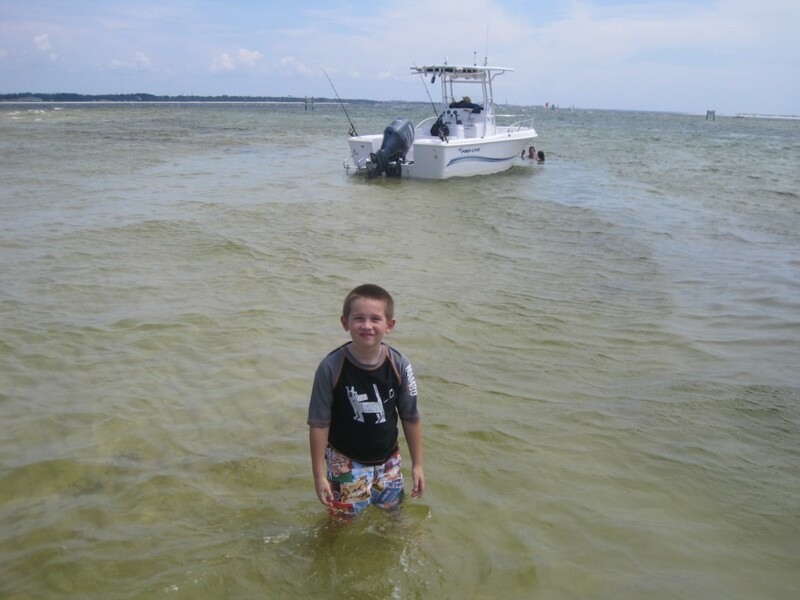 Cathy told us there was an area similar to Destin’s Crab Island towards the west at the mouth of Pensacola Bay. Since we had been to Crab Island before, and I’m such a sucker for new experiences, we elected to go west. We put the boat in the water at about 10am, and it took about 90 minutes to get to our location. 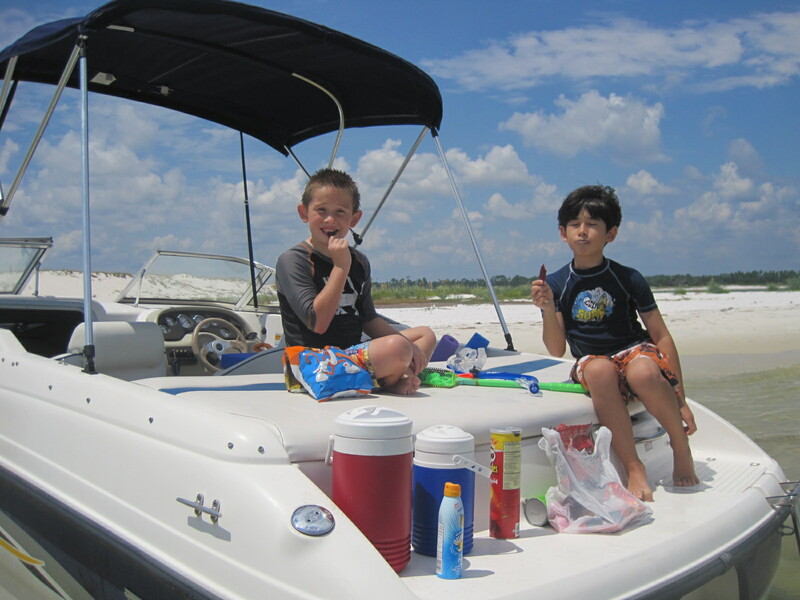 The trip took us past Gulf Islands National Seashore, Fort Pickens and much of NAS Pensacola. When we docked, we were in view of the Pensacola Lighthouse and the Museum of Naval Aviation. The map below shows where we were — on the shore just west of the mouth of the Pensacola Bay, along a channel called Pensacola Pass. When Cathy was trying to tell me about this place, she wasn’t really sure of the name. She and I jokingly called it “The Crab Island-Like Place near Pensacola” when we were planning. 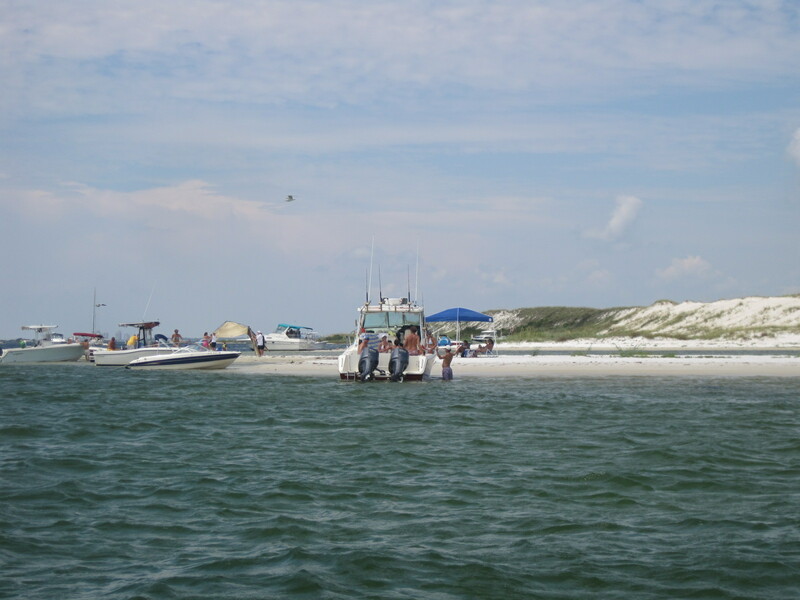 We asked a couple people who were near our docked location about the name, and we heard two names: “Fort McRee” and “Sand Island”. When I looked online, I found a forum post that provided several other names: Admiral’s Island, Dog Island, Pelican Island. Nonetheless, it was a lovely place to dock the boat and play. It was a very Floridian day for us! Enjoy some pictures (mostly of the kids). 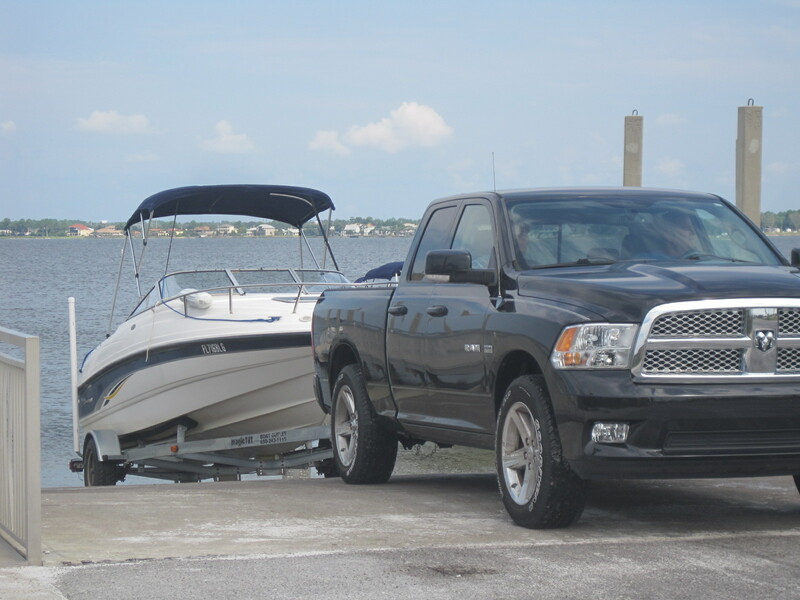 Backing the boat in at the Navarre Beach boat ramp. Timmy enjoyed the ride. 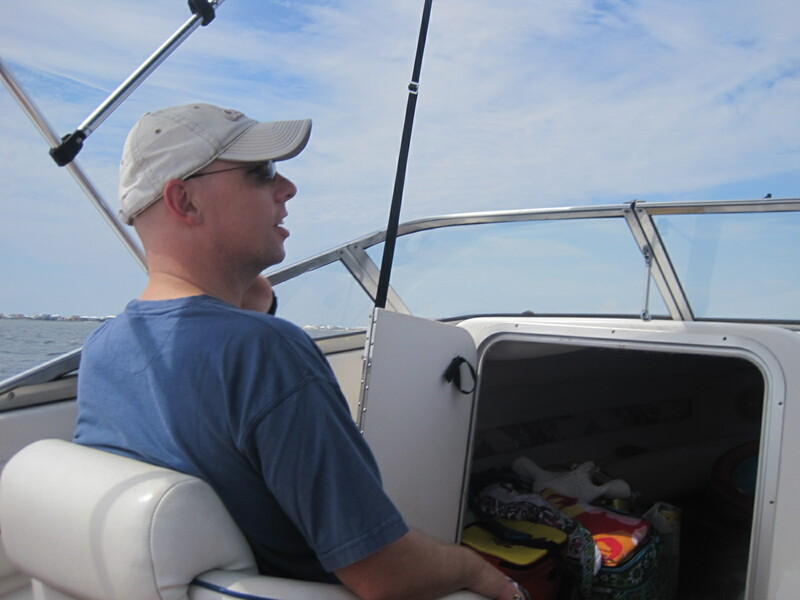 He seemed obsessed with the boat’s wake for much of the trip. 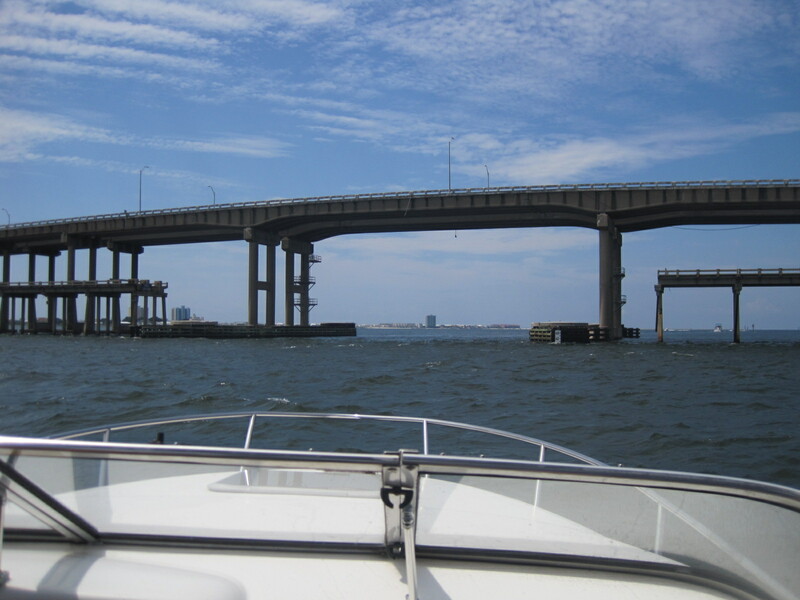 Heading under Pensacola Beach Bridge. Once you’re west of Pensacola Beach Bridge, you’ve transitioned from being in Santa Rosa Sound to being in Pensacola Bay. 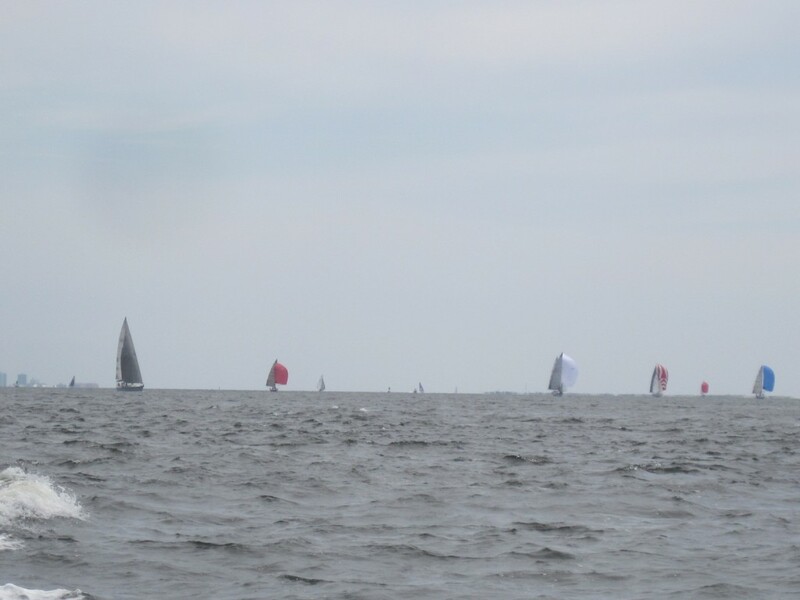 Then we were quite surrounded by sailboats most of the way across the bay. You can also see the chop on the bay. A view of where we were headed at Fort McRee. We docked just to the right of that center boat. Not nearly as crowded as Crab Island. Not nearly as wild and crazy either! Timmy wasted no time leaping into the water as soon as we anchored. Jacob was asking “Can I just jump in?” The water was REALLY shallow, so after plenty of warning about that, we let him do it. 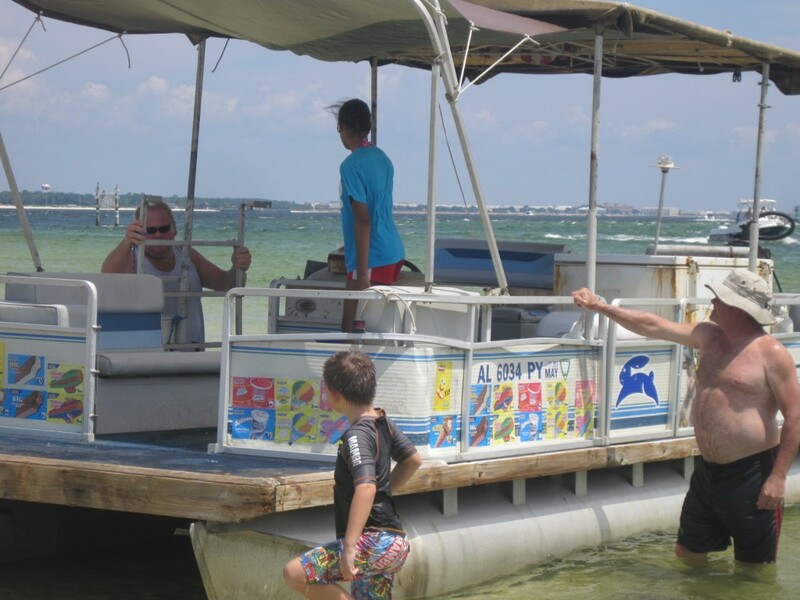 That is an ICE CREAM BOAT! Seriously! It plays the music, and you wave and it pulls right up near you. And of course we let the kids get ice cream. I couldn’t resist this concept! 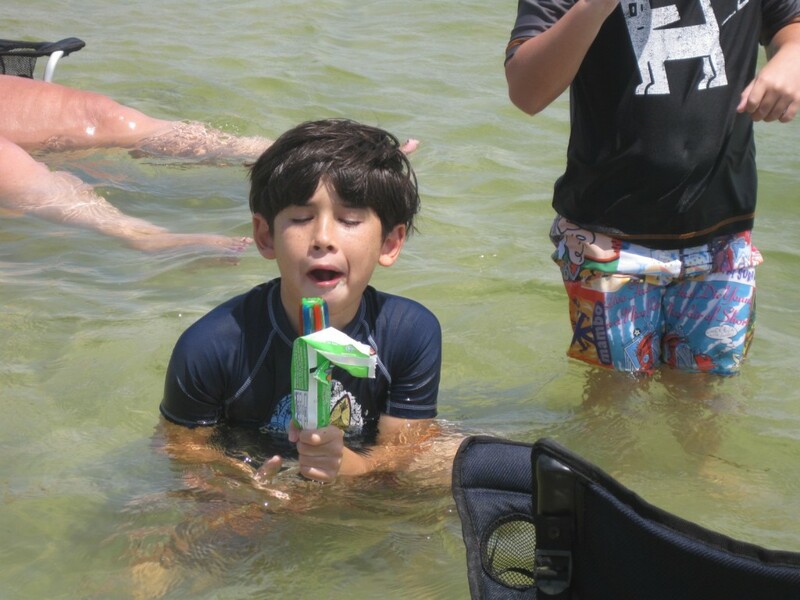 Happy Jacob with his bomb pop. 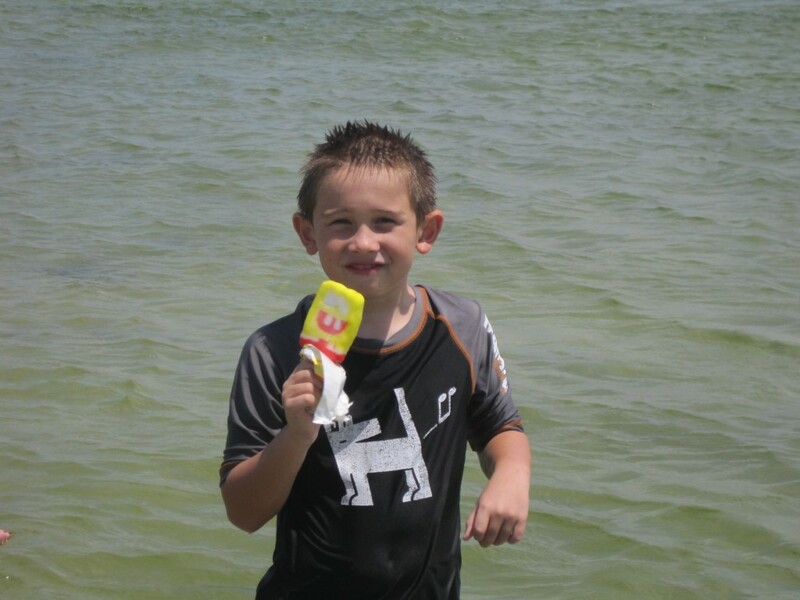 And Timmy was happy with his Spongebob pop. One thing about hanging out with the Scotts — they know how to pack for an outing! We all brought plenty of drinks and snacks! The kids discovered the beauty of beef jerky. After a couple hours at Fort McRee, we headed to Pensacola Beach and docked at Peg Leg Pete’s for a late lunch before heading back to Navarre. Tip: 3pm is a very good time to go to Peg Leg Pete’s. 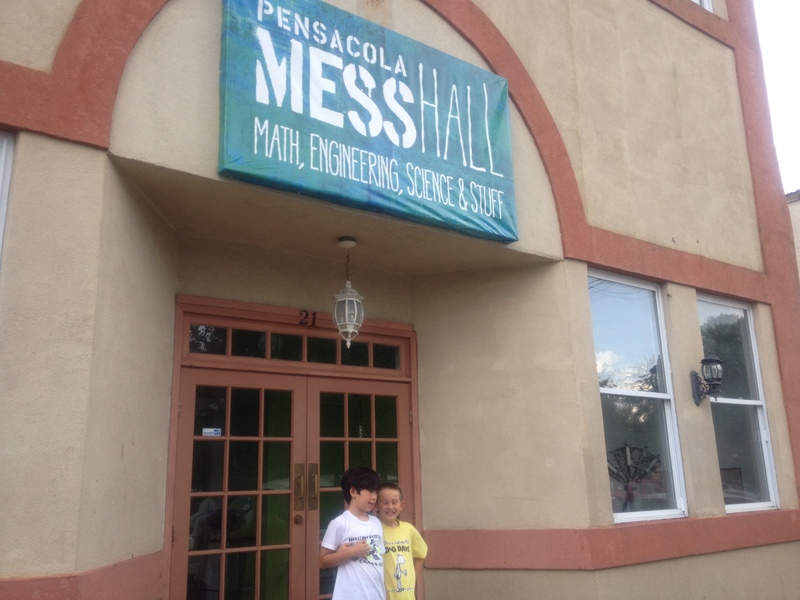 I could have sworn I had heard about the Pensacola MESS Hall from the Pensacola With Kids blog, but I can’t find the reference article. Oh well. 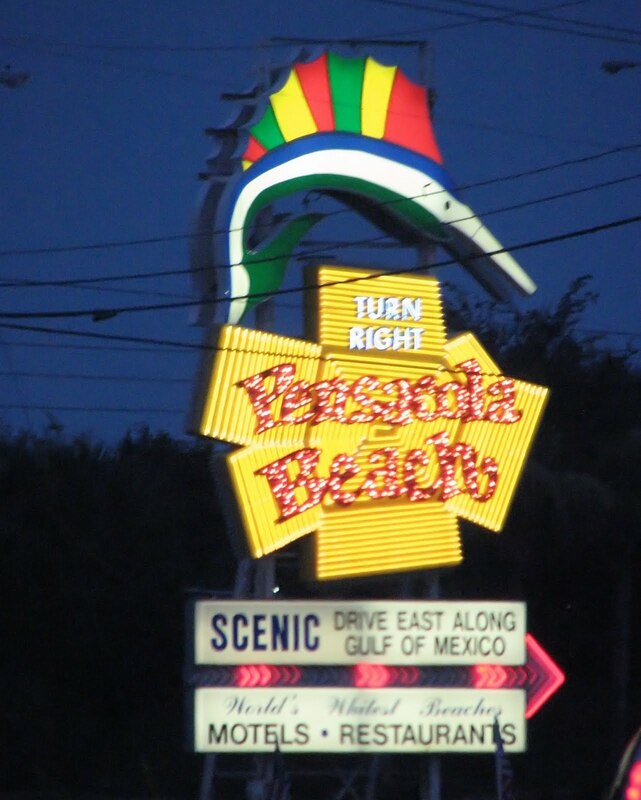 Trust me when I say that I had first heard about it through Pensacola With Kids, but I can’t find the original review now. But what I did find was this story in the Pensacola Digest that came out not long after the facility opened in June. This facility currently is only scheduled to be open through the 3rd week of August (August 18th according to their Facebook page). So what is the MESS Hall? Well, for starters, MESS = Math, Engineering, Science and Stuff. It’s a science center unlike anything I had ever seen. And trust me, I have been to many many science museums and explorer-type centers in my days. The MESS Hall is in downtown Pensacola just a block off Palafox Street near the center square. After spending time here, the family can adjourn to a nice dinner nearby. The MESS Hall has attempted to capture the feeling of a traditional mess hall, which is a military term for where servicemembers eat on the base or on their ships. 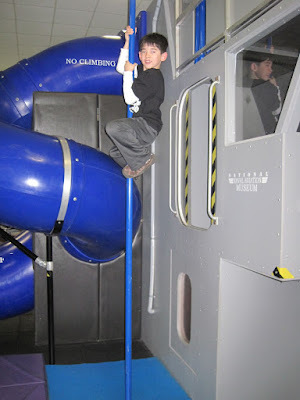 The kids will walk in (after paying the $5 per person admission), and are greeted with a open space with tables and assorted areas for free play with wind tunnels, marble run parts and pendulums. The walls are covered in posters featuring optical illusions. 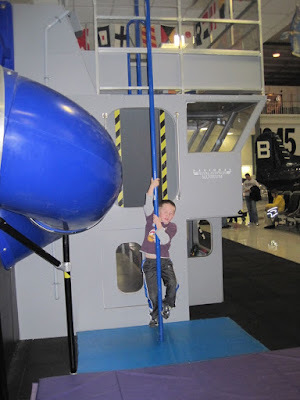 This past weekend my parents came to visit, mainly for my youngest’s birthday, but I’m sure that Dad was super-excited to visit the National Museum of Naval Aviation at NAS Pensacola. On Sunday after breakfast, we ventured the 30 miles west and arrived at around 11am. We left at 3:45pm! Everyone had a great time! There was so much to see. 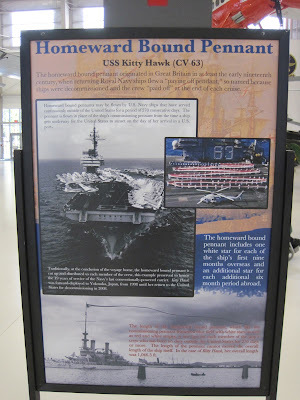 The museum is on the Pensacola Naval Air Station itself, which means you have to pass through a checkpoint. The guard will check for an ID — such as a drivers’ license — and if you just say “I’m visiting the museum” you’ll be let through with minimal fuss. You might be subject to a random search. Don’t say I didn’t tell you! It’s free of charge, always a bonus! I had visited the museum with my friend Paul (of CrashPlan fame) in December 1998 when I was TDY* to Hurlburt Field for some training with my AF Reserve job. There’s a lot of wonderful history in this museum, from the birth of Naval aviation in 1911. They have several originals of “first” aircraft (like the first seaplane to cross the Atlantic), and they also have a collection of “last” aircraft, such as the last F-14 Tomcat to fly in combat. In those short two years since I was there last, there were many changes to the museum, all for the better! First of all, the museum made improvements at the front entryway, adding a nice timeline of all aircraft carriers, and they added a lovely children’s play area. Also, we were able to take a bus tour of the “flightline” section of the museum, where aircraft were parked awaiting restoration. 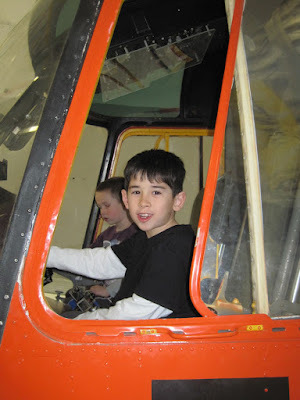 The bus driver/narrator told some great stories of each of the aircraft! These aircraft parts were recently retrieved from the Great Lakes! Another big change was the addition of the “Hangar One” area. This opened in mid-January 2011 and nearly doubled the indoor display space for aircraft! Up above is the USS Kitty Hawk’s “Homeward Bound Pennant” which was flown on its way home from Japan for decommissioning in 2008.